Members of ARTBA’s local affiliate, the Metropolitan Washington Road & Transportation Builders Association (MWRTBA), were on hand Oct. 20 at the Francis L. Cardozo high school for the launch of the “FLEX-ACE Lab”, an immersive Science, Technology, Engineering and Mathematics (STEM) educational environment that allows teachers to instruct through real-world gaming scenarios. 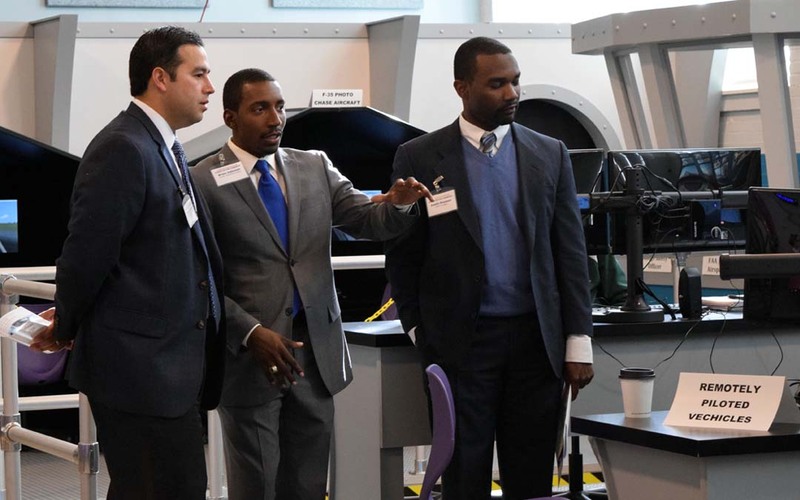 The Washington D.C. school is now home to the 15th FLEX-ACE Lab in the world. The lab was established through a partnership with the Office of the Assistant Secretary of Defense for Research and Engineering. Several members of the United States Department of Defense attended the ribbon-cutting ceremony, along with members of D.C. government, the Federal Aviation Administration and the District’s Public Schools. Other attendees included the school’s TransSTEM Academy Partners, made up of representatives from the District Department of Transportation, General Electric, Lockheed Martin, the National Association of Women in Construction and the National Air and Space Museum, among others. The TransStem Academy was established in 1991 as the first transportation studies academy in the Washington metropolitan area. The lab includes state of the art computers, flight simulators and a miniature Air Traffic Control tower and applies immersive and innovative theme park concepts to classroom learning. It is the brainchild of TEQGames, a learning company founded by Universal Studios executives. Cardozo said in a statement that the lab will be a complement to its Project Lead the Way Engineering career pathway, and in particular the Aerospace Engineering course offered at the school.